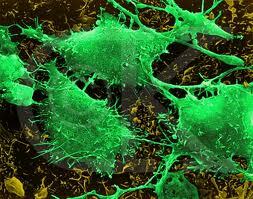 Metabolic protein plays unexpected role in tumor cell formation and growth ~ Health Matters Today! The embryonic enzyme pyruvate kinase M2 (PKM2) has a well-established role in metabolism and is highly expressed in human cancers. Now, a team led by researchers at the University of Texas MD Anderson Cancer Center reports in advance online publication of the journal Nature that PKM2 has important non-metabolic functions in cancer formation. "Our research shows that although PKM2 plays an important role in cancer metabolism, this enzyme also has an unexpected pivotal function – it regulates cell proliferation directly," said senior author Zhimin Lu, M.D., Ph.D., associate professor in the Department of Neuro-Oncology at MD Anderson. "Basically, PKM2 contributes directly to gene transcription for cell growth – a finding that was very surprising." In metabolism, PKM2 enhances oxygen-driven processing of sugar known as aerobic glycolysis or the Warburg effect found in tumor cells. "Cancer cell metabolism and cancer cell cycle progression, which are essential for tumor formation, are conventionally thought to be regulated primarily by distinct signaling complexes," Lu said. The new findings integrate the two major mechanisms for regulating cancer cell growth by a key metabolic enzyme. "These two important regulatory processes are under the control of pyruvate kinase M2." Beta-catenin activation that is independent of the Wnt signaling pathway have been observed in many types of cancer. This study reveals a critical mechanism underlying Wnt-independent beta-catenin activation and indicates that c-Src-phosphorylated beta-catenin and nuclear PKM2 are independent predictors of glioma malignancy. PKM2-dependent beta-catenin activation is instrumental in EGFR-promoted tumor cell proliferation and brain tumor development. c-Src activity, beta-catenin Y333 phosphorylation, and PKM2 nuclear accumulation are positively correlated in human glioblastoma specimens. Levels of beta-catenin phosphorylation and nuclear PKM2 are correlated with grades of glioma malignancy and prognosis. One potential implication of their research is the potential use of c-Src-dependent beta-catenin Y333 phosphorylation levels as a biomarker for selecting patients for treatment. "This finding is very important because EGFR-based therapy is not very efficient due to drug resistance, and cancer patients need alternative treatment strategies," Lu said. "Thus, this discovery can potentially serve as a guideline for personalized cancer therapy in the treatment of glioma and other tumors with Src inhibitors."